I SIGN THIS PETITION IN SOLIDARITY with the Sahrawi people who seek the ratification of the Independence Referendum put forth by the United Nations in 1992. I support the idea that the Western Sahara question is a matter pertaining exclusively to the recognition and implementation of the tenets put forward by the United Nations Letter on Decolonization. And as stated, the Sahrawi people possess the inalienable right to determine their own future. WE, AS CITIZENS OF A UNITED GLOBAL COMMUNITY, agree that we are deeply concerned with the enormity of human rights violations that occur daily towards the Sahrawi people by the authority of the occupying government of Morocco. For 34 years, Morocco has illegally occupied the Western Sahara territories and has created a climate of fear and terror among the civil population by enacting serial acts of repression ranging from arbitrary detentions, imprisonment, torture, disappearances, murders, judgments without warrants, prohibition of assemblies or demonstrations, unlawful entries into homes and the persistent presence of the police and the army in the streets. -WE STATE THAT WE DENOUNCE the living conditions of the Sahrawi citizens in the occupied territories. WE INSIST on the cessation of all repression against the Sahrawi civil population, the unlawful judgments, the continuous violation of human rights on the part of the Moroccan government and the persecution of those who try to peacefully defend their own freedom and the independence of their people. -WE DEMAND from the Kingdom of Morocco the immediate liberation of all Sahrawi political prisoners, the cessation of repression and tortures, and the unequivocal annulment of past and future illegal judgments made without legal warrants. In summation, we urge the end of the occupation in the Western Sahara territories. -WE MAKE A CALL for an urgent and permanent presence of international observers and media in the Western Sahara as a safeguard that will respect the human rights of the Sahrawi population and will testify to the actual situation in the area. -WE DEMAND the restoration of the legitimate rights of the Sahrawi people, and especially of their RIGHT to SELF DETERMINATION with the celebration of the enactment of a free, transparent and democratic Referendum of Liberation. This Petition was penned May 2009 in High Falls NY at the occasion of The mini aaa Conference, a biennial meeting of cultural anthropologists reporting on the origins of power inequity and its impact on the present persistence of global Human Rights violations. Mini triple aaa conference in High Falls, New York. May 2009. 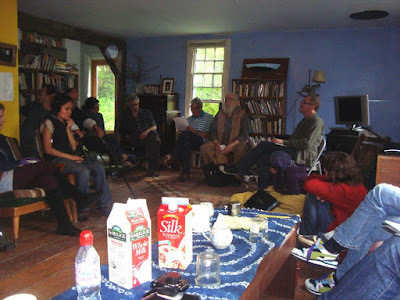 A biennial meeting of anthropologists sharing their recent lines of work. 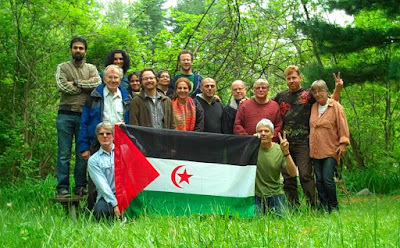 Participants in the conference in support of a FREE SAHARA. Is to have it tethered inside its immensity. 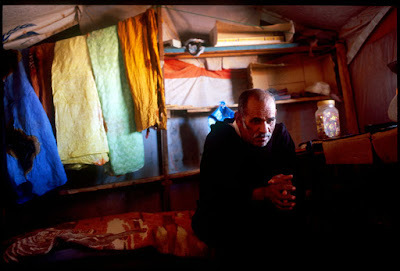 If something underlies Saleh Abdelahe’s beautiful poem –significantly titled Bedouin—is a feeling of powerlessness: the contradiction between the effort of liberation, the legitimate continuity of a free life in the vast desert, and the fact of being forced to exist in captivity in only a minute space of it. In a way, the poem could function as a metaphor of the conflict of the Sahrawi, a torn people lost for thirty four years in a political limbo and trapped in a nightmare from which they cannot wake up. 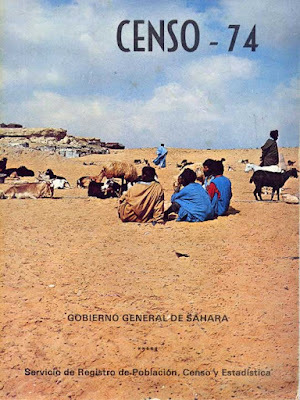 Cover of the 1974 census of Sahara inhabitants. 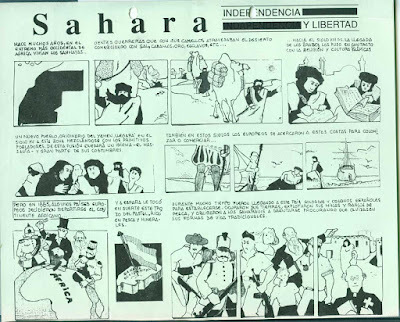 The history of Sahara in a comic book. 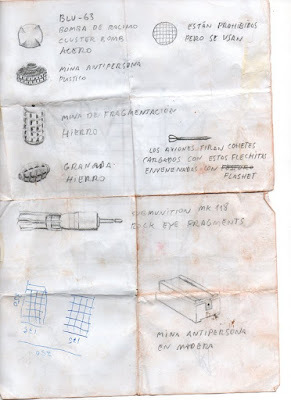 From the Lefrig Museum of Sahrawi Resistance files. Western Sahara is the only colony in Africa that has never achieved its independence. In 1975, during the agony of the dictator Franco, the Spanish authorities signed a secret treaty that delivered the Sahara province to Morocco and Mauritania, stabbing in the back those who until then had been our fellow country people and abandoning them defenseless to the beast that has devoured them. The "Green March". 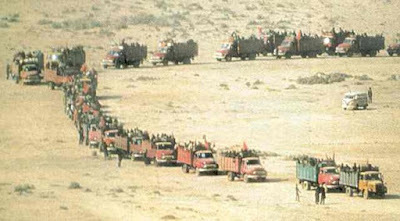 Morocco's military invasion of Western Sahara, 1975. With the shameful fleeing of Spain, Morocco initiated a military occupation of Western Sahara sinisterly called the “Green March”. Many thousands of Sahrawis fled overnight in an exodus to the desert and were chased by the French and Moroccan aviation. Without the possibility of hiding in the desert, men, woman, elder and children were bombarded with napalm. Those who survived walked to take refuge in Southwestern Algeria. A place that the locals call the hammada, which means hell. Exile. Photo by Pablo Balbontín. The walls constructed by Morocco around the occupied territories over the years. There was a sixteen year war between Morocco and the Polisario Front, the liberation movement that founded the Sahrawi Arab Democratic Republic (SADR) in exile. 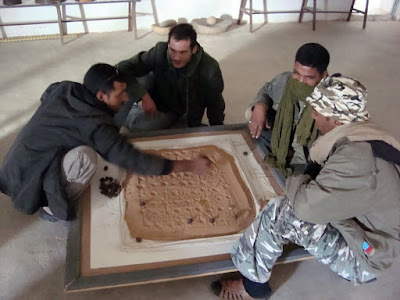 Although Morocco has a huge army and had the backing of France and Israel, the Sahrawi displayed guerrilla tactics with a deep knowledge of the land and were a fierce enemy fighting for their just right. When in 1991 the UN forced the two countries to sign a ceasefire Western Sahara was split by a painful wound that cuts transversally through the territory: a thousand mile defensive wall built by Morocco that is known as the Wall of Shame. This earthwork fortification divides Western Sahara in two, with Polisario controlling the area east of the wall and Morocco controlling the area to the west. 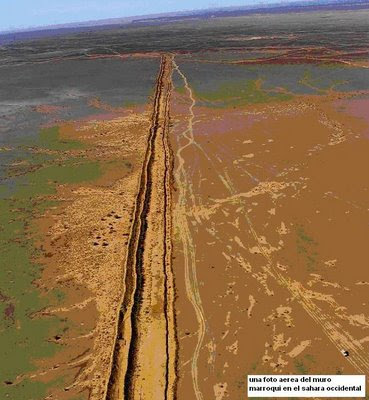 The barrier minebelt that runs alongside the wall is believed to be the longest continuous minefield in the world. And it keeps on causing accidents. More than a hundred thousand Moroccan soldiers watch the trench with barracks every three miles to assure that the occupied territories stay in the hands of Morocco. A gigantic earthwork for a strategic failure and a total bankrupt to maintain. The Wall of Shame, a gigantic strategic failure and a bankrupt project. Boucraa Phosphate Mines in the occupied territories. 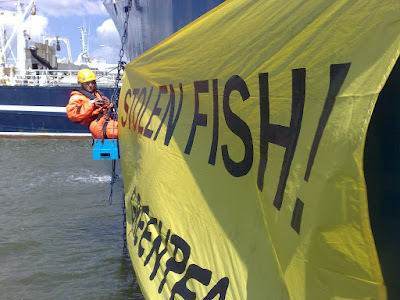 Greenpeace protesting Morocco's ilegal trade with Sahara's fishing resources. 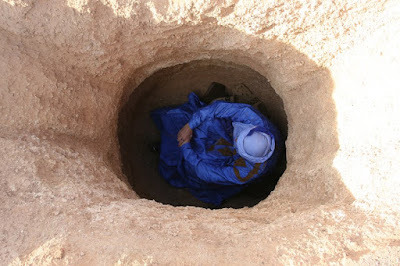 The western part of Sahara near the Atlantic coast is a very rich land whose subsoil contains abundant water and oil. Its phosphate mines and its fishing bank –the most abundant in the World—are consistently trespassed by the invading power who illegally issues permits to international corporations for the exploration and exploitation of oil and natural gas. 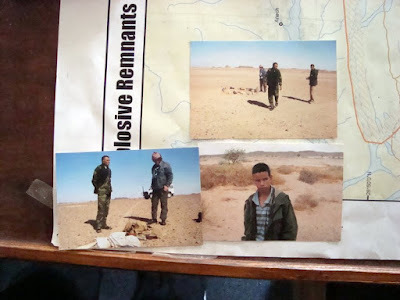 At the same time, in the occupied territories, Morocco maintains a police state where human rights are continually trampled on and where the watching, the harassment, repression, disappearances and tortures inflicted on the Sahrawi people are the everyday norm. 27 de febrero refugee camp, Algeria. 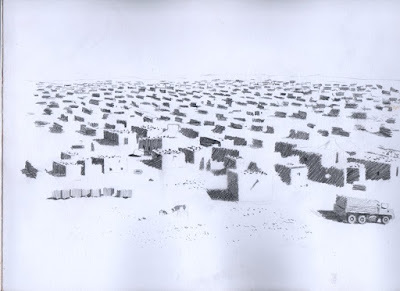 On the other side of the Wall, a nation founded on exile survives in the refugee camps, with two hundred thousand souls planted in one of the most inhospitable deserts of the world, subsisting on scarce international aid, waiting for a solution that doesn´t arrive. The peace process between Morocco and the Polisario is stagnant and the UN 1992's mandate for a referendum where the Sahrawi could decide on their independence is proven one of UN's biggest failures ever. The relative autonomy plan that Morocco is proposing for the region wants to shelve an illegal occupation of which the Moroccan government is guilty and the Spanish state is responsible. 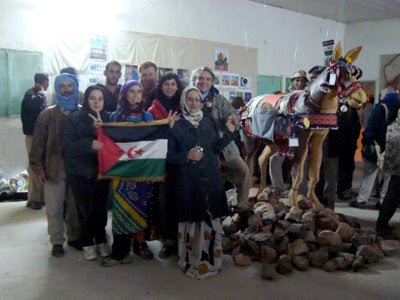 International Art Meetings ARTifariti 08, in the Free Territories of Western Sahara. This is, in outline, the nightmare scenario in which our Sahrawi friends wake up everyday. A present without past nor future that puts time against the wall. An scenario that is usually under the radar of media. I have had the chance to know Sahara in an unique experience that has transformed and opened my eyes to this liberation project, giving me a new perspective of reality. With these notes I will try to explain how a experience of injustice, forgetfulness and savagery has been at the same time the most incredible experience of my life. I have been several months preparing for this trip. Now, in a ramshackled seat of Air Algerie 6146 flight, holding a jus d’orange in my hand and squeezing a backpack between my legs, I realize I’m really going to Sahara. Landing at four in the morning in Tindouf military airport, a huge rising Moon smiles at us from the horizon. We are approaching the Moon perigee, the time of the year in which the Moon looks bigger because is closest to the Earth, which also bears strong tides. From the 33º latitude of the Sahara, the Moon looks more lying down, like in Colombia, where it looks like a hammock hanging from the stars. I am travelling with my dear pet: the e-mule Taína, loaded with presents, messages and baraka collected among the people back home in Seville and the motto PEACE AND TRANQUILITY for the Sahrawi people, together with different proposed activities to do in Tifariti like the camel paella and the qi gong, music and astronomy workshops. 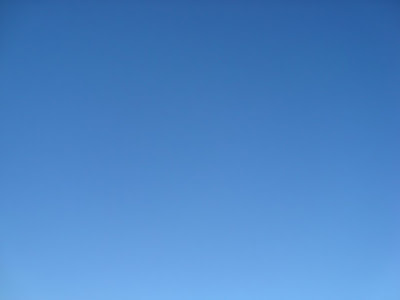 The Sahara skies are one of the most beautiful spectacles on Earth. With the telescope donated by Salvador Capote and the Astronomers Association we are going to see, and almost touch the stars. Orion, the Pleyades, Polaris, shooting stars... Here they have different names: El Machboh, Eswabia, Ezraia... My friend Isabel has prepared blank planispheres in which we are going to draw invented constellations, using the firmament as a projection screen. 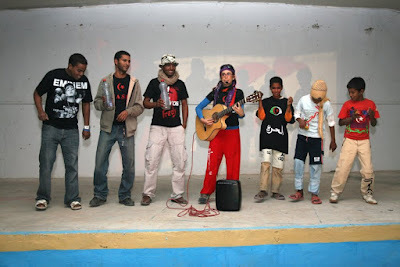 We are going to learn the Sahrawi legends written on the free skies that protect and inspire us. 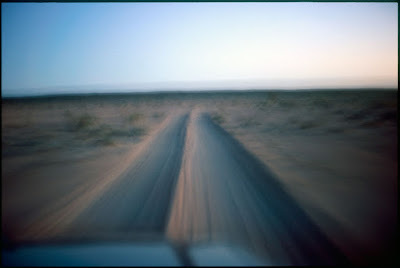 At dawn we depart in an all-terrain caravan to cross the three hundred miles between the Tindouf refugee camps and the enclave of Tifariti in the Free Territories strip. The first impression of the desert is light. Everything is flooded with light, Sun, clarity, heat. Then there's the immensity of space, silence and emptiness. 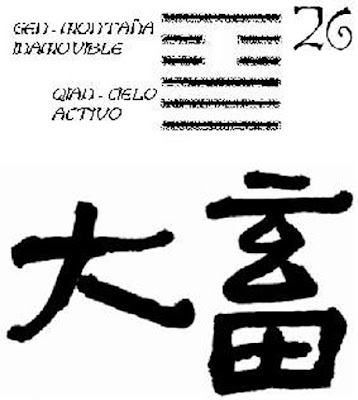 For the taoists the Wu Chi is the Great Void from which everything is originated. Standing on a limitless flat plain where four thousand years ago flourished a green savannah, I open my arms to the ten million square kilometers of infinite sand. Space is so enormous it erases time. 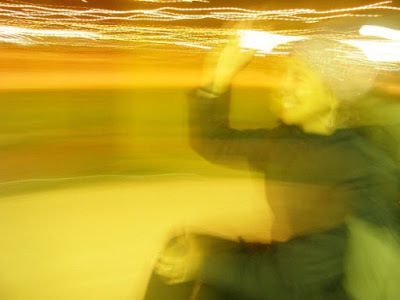 I remember Albert Einstein's memorable words: "Past, present and future are only forms of the same illusion". 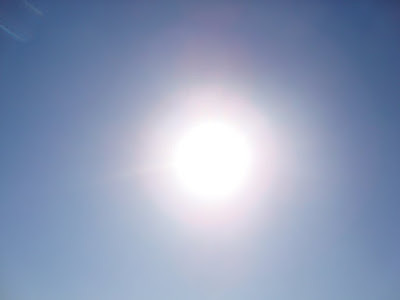 The Sun gives without receiving. 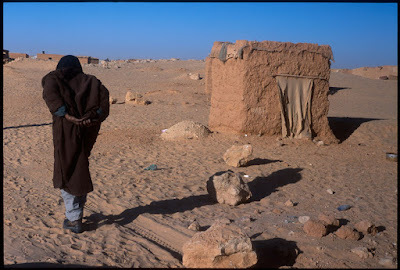 In the stoney plain of the Algerian hammada there live, for the past thirty four years, about two hundred thousand Sahrawi refugees that subsist exclusively on international aid in desperate human and sanitary conditions. In these camps, where jaimas and adobe houses rise in the most inhospitable of the deserts, people breath dust and goats eat plastic and the UN resolutions. Electricity comes from a car battery connected to a solar plaque that runs for a few hours. The orchards have only one or two plants, very well taken care of though. Life in the camps is hard. 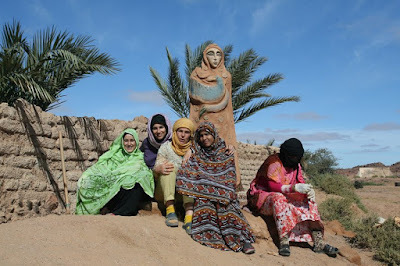 The Sahrawi are accostumed to the heritage of their exile: sand and more sand, stones and mores stones, sky and more sky. 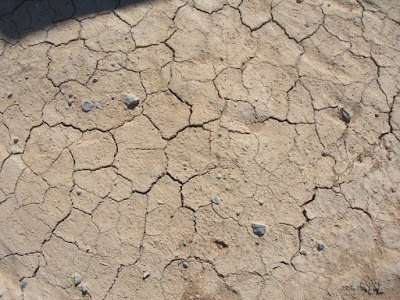 Temperatures in summer and in the shade can reach 122º F and there's no way to escape it. It's inhuman. There are no resources, there is no production. They feed themselves with the international help that arrives. Every family receives every month two pounds of pasta, legumes, rice, milk in powder and a quarter of a gallon of oil per person (except the husband). They also get a pack of flour an a bottle of butane. 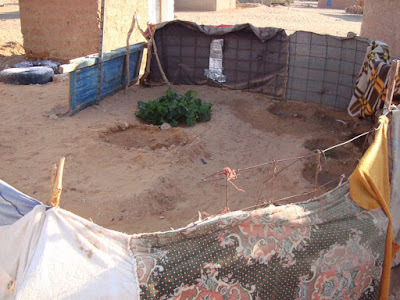 The few fresh vegetables grown in the orchards are reserved for the children and those who are sick. 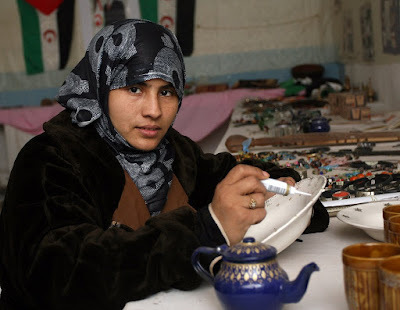 Nonetheless, Sahrawis are happy because they are born lacking everything and they don't miss anything. They are used to sharing what they have. At lunch time everyone who arrives in the jaima is welcome to sit at the table. A little garden in the Ausserd camp. 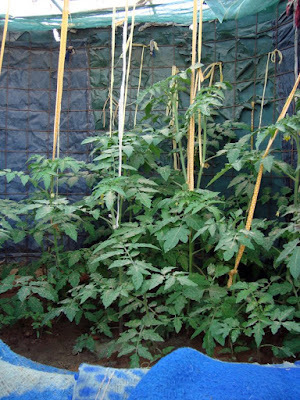 The loveliest tomato plant in the camp. 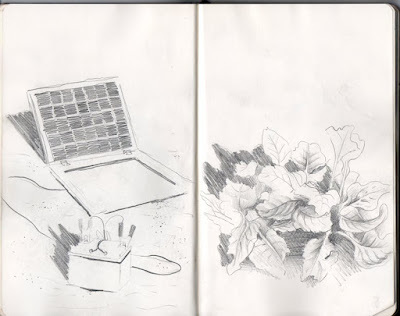 Drawing of a small energy plant. 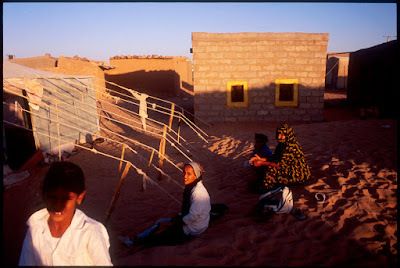 27 de febrero refugee camp, the name stands for the date of the foundation of the Sahrawi Arab Democratic Republic in Bir Lehlu, 1976. 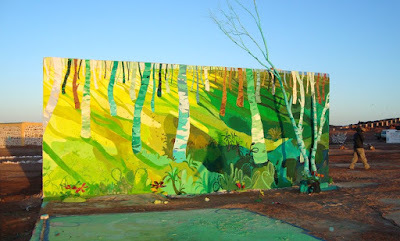 The desert is changing colors and texture as an animated painting. We have crossed all the hues of ochre, red, white, and more to the south, green. Once in a while, we pass a tire stuck in the ground, the only sign of contemporary human presence. Hamdi, our skillful driver keeps on navigating the changing signals on the tenous sand routes where the map is blank. He lights his pipe and plays again the Estrella Polisaria tape and the hipnothic rythm of the tidinit and the electric piano mix with the speed, the bumps, the stones and the infinite horizon in a continuous trance. 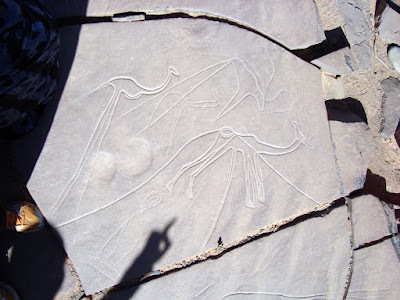 A whirlwind, a mirage, rocks with weird forms... We see wonderful petroglyphs of human figures, symbols of Mother Earth, giraffes and deers in a rock... I imagine when this was a green savannah and now there's only earth and sky. Ancient Chinese medicine conceives man as a microcosm of the universe and as the result of the interaction of the Ying of Earth and the Yang of Skies. For the taoists everything comes from the Wu Chi --Wu means void and chi is energy-- the Great Void, the cosmic matrix where galaxies, life on Earth and ourselves are born. Quantum physics is discovering how the primordial void, populated with elementary particles --as Higgs boson, the Divine Particle-- gives birth to the Universe. 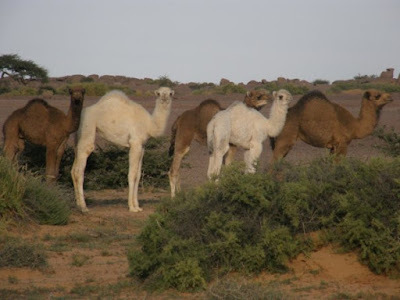 In this trip we are also going to discover how the desolate landscape of the desert is actually full of life and that even in the most inhospitable land a paradise can be born. A stop to eat under the protecting shade of a talja and the bread and cheese has never tasted so good. Intervention by Carlos de Gredos. What's the color of dreams? 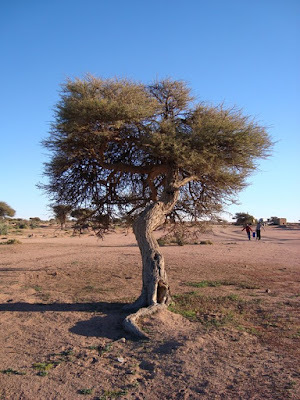 Talja (Acacia arradiata) is the tree of the desert, a symbol of resistance. 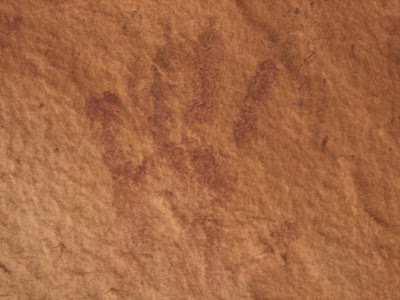 Hand painting at Erqueyez archeological site. Resting under the shade of a talja. We are really close to the wall now and you can even see the Moroccan soldiers checking us out with binoculars in the distance. I remember the recent tragic events that took place in a peaceful protest organized by The Column of the Thousand in front of the Wall of Shame. 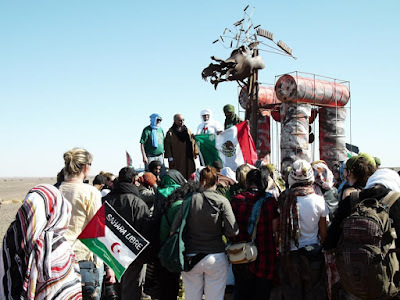 About 2.500 people including activists from Spain, France and Portugal together with Sahrawi and disarmed polisarios and without uniforms concentrated less than a mile from the wall. They marched forming a peaceful human wall towards the military fortification of Morocco's feudal regime. 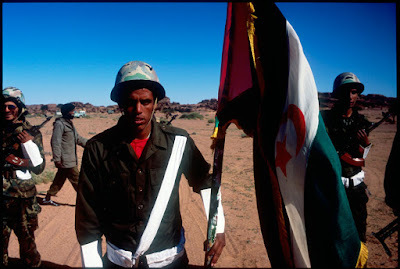 In spite of polisario's warnings, a group of youngsters jumped over the security cordon and advanced towards the wall pulling out the poles and barbed wires which are 150 yards from the trench, going into the minefield as they threw rocks to the soldiers that responded showing their rifles. Demonstration in front of the Wall of Shame, april 2009. The Sahara Bike Race joining the peace protest. 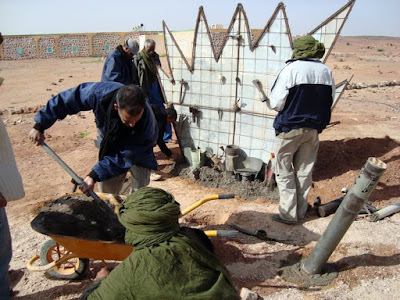 The sixteen year old Brahim Huesin Labeid, stepped on a mine that blew off his foot and four other kids were wounded, being evacuated by members of the NGO Landmine Action to the hospital in Tindouf. People dispersed in shock and some cried while remaking their steps on the truck tracks. How long have we to wait for the media to report the Sahara's humanitarian tragedy when a disgrace like this occurs? How long will silence engulf this tragedy? How much genocide must occur? 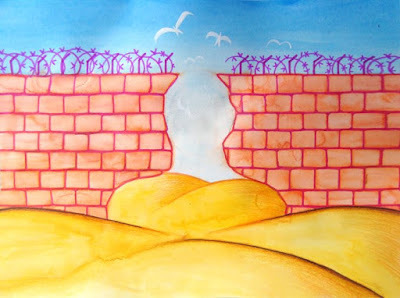 The ARTifariti International Art Meetings are born as a peaceful opposition to this barbaric wall. 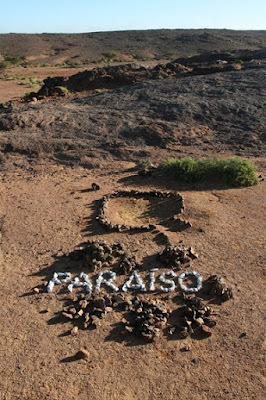 The festival's executive producer Fernando Peraita --president of the Sahrawi Friendship Association of Seville-- explains how he came up with the idea when looking at images of the wall on Google Earth and thinking about it as a "land art of death" that could be addressed with a cultural event of peace and denunciation. Now it is a reality in its second year. As we arrive in the little post of Tifariti, we immediately experience its favorable feng shui. I imagine that the Spanish military that founded this community guided themselves by the same crossings of teluric lines that the nomads follow in the desert. We check the school building where we are going to live and work for the next days. We have all the space in the world and there is an utopian feeling: that of a whole country to be built. Here we have the internet, an assembly hall and a beautiful jaima to house panels and talks, music and dance until the electric generator is shut off. There is a truly wonderful energy among the people. 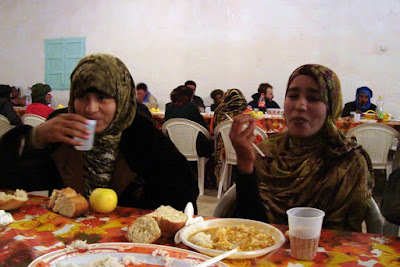 The Sahrawi cheerfulness and kindness is contagious. 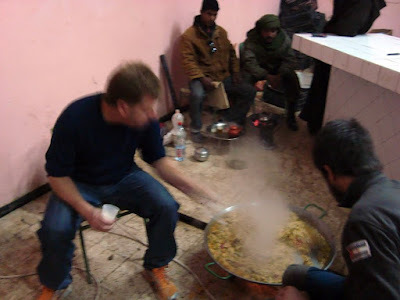 The hospitality in Sahara becomes a way of life, filling everyday with magic. We start learning about our fellow artists projects and works. 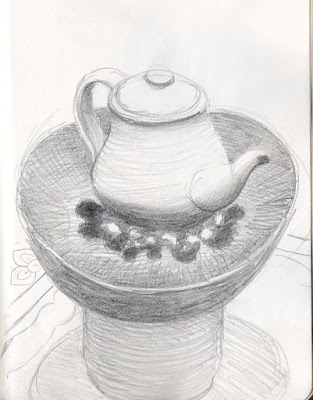 We drink tea and shower in cold water. We eat camel and drink cranberry Fanta in the lively dining room, and we end up the day so tired that even my roommates in solidarity sleep with my snores. 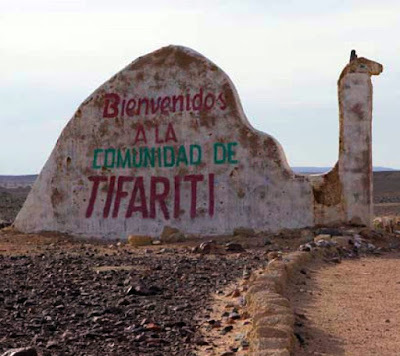 As journalist Valeria Saccone explains: “Tifariti stands as an emblem of recent Sahrawi history. In 1976, the first refugees fleeing from the Moroccan occupation took shelter in Tifariti and were bombed with napalm and white phosphorous”. 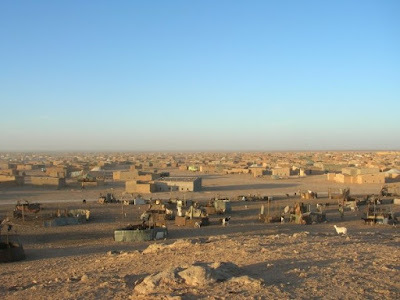 An old man told me that “even the rocks burned…” Today Tifarit is solely inhabited by Polisario military and semi nomad sheperds. The civil population is still living in the camps in a provisionality that is stable in its perpetuity. 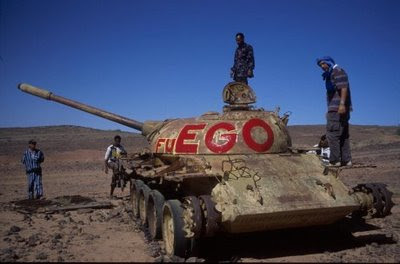 Intervention by Carlos de Gredos in a downed Moroccan tank. Cries under Tifariti's rubble. Mural intervention on bombarded houses by Abd El Kader Belkhorissat. 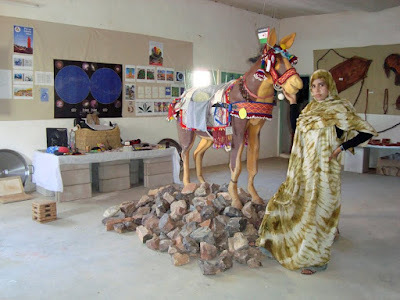 Sahrawi Trojan Horse by Rolando de la Rosa. The dear Mexican artist Rolando de la Rosa is the media star of Artifariti 2008. The reason is that he’s building a giant Sahrawi Trojan Horse sculpture with junk and the abundant war leftovers that there are everywhere. The idea is to push the monument –that carries the UN resolutions in its innards—to the Wall of Shame itself in a peace march headed by Mohamed Abdelaziz, president of the SADR. 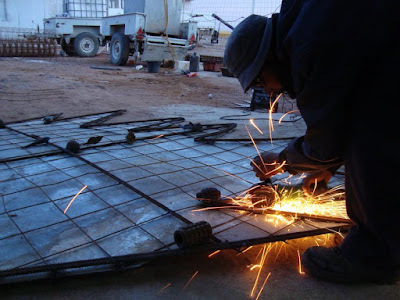 As Rolando downloads heavy junk from an all terrain at the school´s entrance the many Spanish, Sahrawi, Algerian, Argentinian and Peruvian artists start to shape their proposals. This incipient “City of the Arts” that Tifariti becomes for two weeks is boiling with activity and everybody adds to the broth. There’s a solidarity synergy that unites us in a common cause. Pulling the thread. A collective woven map of Sahara's routes by Claudia Martínez. Painting workshop with Eduardo Romaguera. 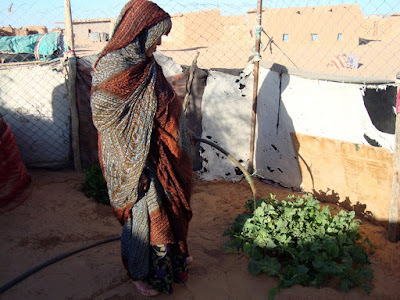 Sahrawi Woman. 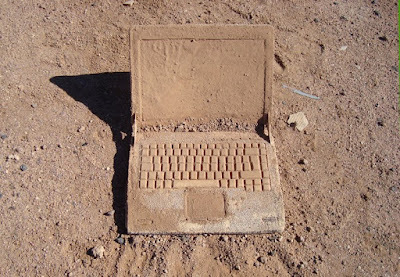 Sculpture by Rosamar Corcuera in Tifariti's orchard. Victoria Gil has started her wonderful portraits project in which she interacts with everybody through the magic of her drawings. 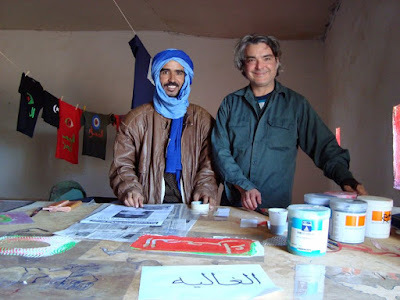 Her brother Alonso is working hard stenciling and silkscreening t-shirts, pants, military uniforms and traditional dresses with libertarian slogans and pacifist drawings. Carmen Carmona is doing a henna drawing exchange where she is being tattooed with the words FREE SAHARA on her belly. 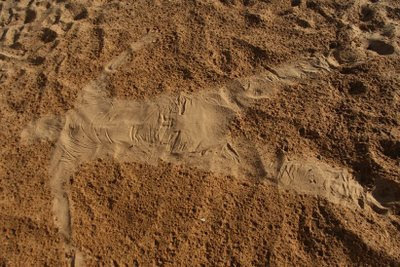 Until the henna dries she cannot move much, so she starts to make drawings and plans for another performance that will be a walk around Tifariti’s conmemorative monuments. Alonso Gil dress painting workshop A pintarropa! (Point/paint blank!). Carmen Carmona henna tattoo's exchange. Pililli Narbona is my long time friend whose the singer of the band Moakara, from Seville. We have collaborated for years, I make her album covers, t-shirts and now videos, we are a source of inspiration for each other. Pililli is here to do a musical exchange with local musicians. 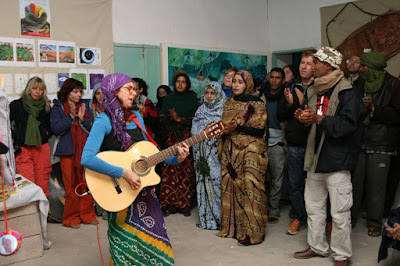 She is playing tonight with the Sahrawi band Tiris, and she has started to compose an hymn called Libertarian Sahrawi that we have to make a hit. Tifariti has a little museum of art, archeology and ethnography. 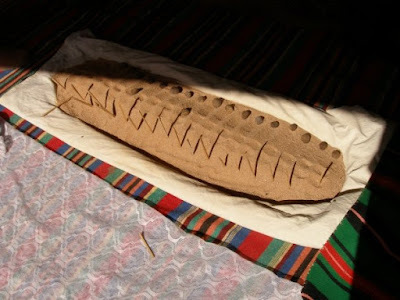 Here are the works of Sahrawi artists from last year’s festival, a handcrafts shop, an archeology exhibition and a fascinating ethnography room with all the camel implements, tools to work the land, make bread, sand games, knifes and old pistols, ceramics, baskets and everyday utensils. No doubt this is the ideal space to house the mule Taína. I ask Mohamed Baecha, who runs the museum and he receives our pet with open arms. Taína is our vehicle to share ideas and experiences among the people. So I start to unpack the telescope, the sand laptop and a cargo of books, drawings, photos, poems, paintings, dolls, amulets, spells and all that people have sent in her saddle bag. 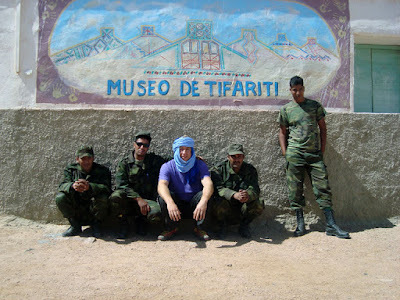 At the entrance of the museum with my Polisario friends. 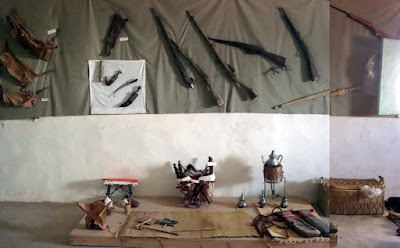 Ethnography room at the museum. Taina's cargo of presents, messages and baraka to exchange. We arrive here full of projects and goodwill to contact and collaborate with everybody and basically give good energy. 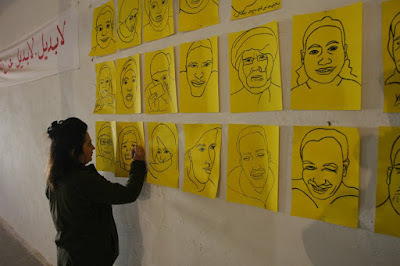 We believe that the arts are great tools to work for human rights and for the rights of the persons and the peoples to their own land, their rightful culture, their roots and their freedom. 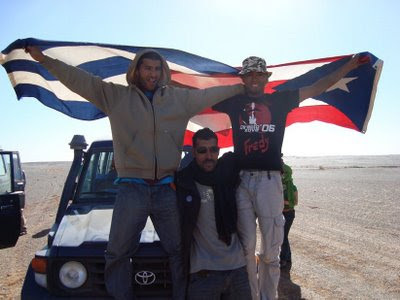 Cuba y Puerto Rico en el Sahara! School day at the 27 de febrero camp. 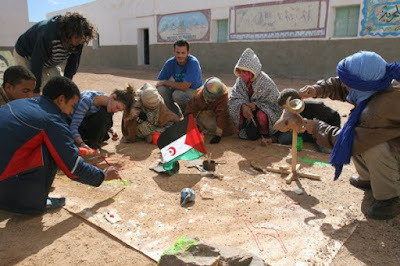 Sahrawi magic of the gift. Thinking about all this I go out for a walk. 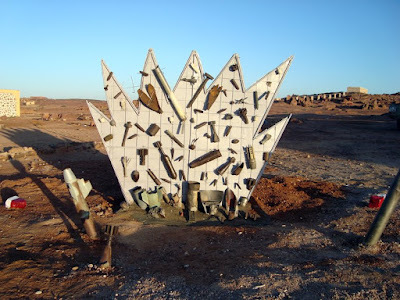 The country around Tifariti is full of junk from the war, remains of bombs and projectiles, even a downed Moroccan tank that Carlos de Gredos has interveined painting words on it. The wind is calm now and there reigns the most wonderful silence. Looking northward I recall the proximity of the thousand mile Wall of Shame. 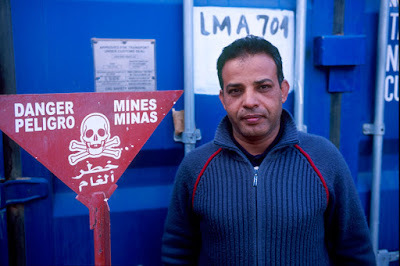 I find Hassan, who tells me he works clearing mines for Landmine Action. This NGO have their base next to our school. 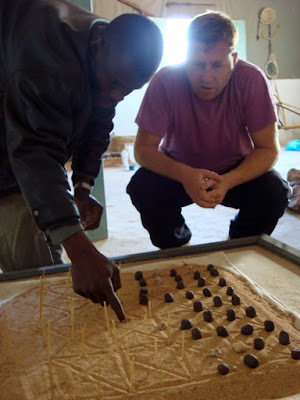 Hassan and Ahmed Sidi Ali –the program’s director- show me the little museum they have put together with all the landmines and explosive remnants found in the area. 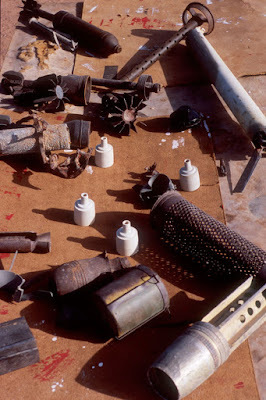 They use this material to show children and bedouins how to identify lethal bombs in the desert: cluster munition, mines, grenades, mortars, rockets… the arsenal is frightening. I hear the account of various accidents and look at the documentation: a dead shepperd, two wounded kids… I wonder on the obstinacy of the human species on its self-destruction. 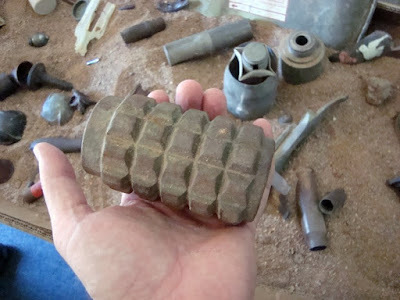 I watch impressed these deadly objects as a catalogue of the genocide the Moroccan kingdom has inflicted on Western Sahara. Objects that should only belong in a museum as the vestiges of history’s senseless violence. Ahmed proposes me to do a sculpture with all this to install at the entrance of the base and I readily go for it. I will think about something and come back tomorrow. Ahmed Sidi Ali, Landmine Action's program director in Western Sahara. Photo Pablo Balbontín. Vestiges of History's senseless violence. 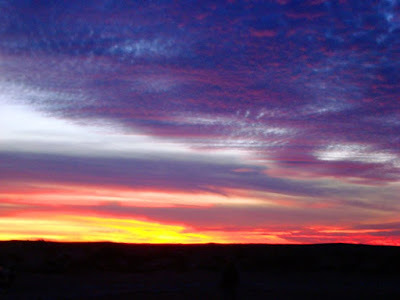 The Sun is going down over the horizon with the most spectacular projections of mauve, orange, pink and yellow on the miles long clouds of the desert. While I’m walking towards the school I realize it’s December 1st, and that my astronomer friend Isabel had told me something about a unique planetary conjunction that was going to take place tonight. Crossing the firmament, tonight the Moon is going to pass so near Venus and Jupiter that she’s almost going to touch them. 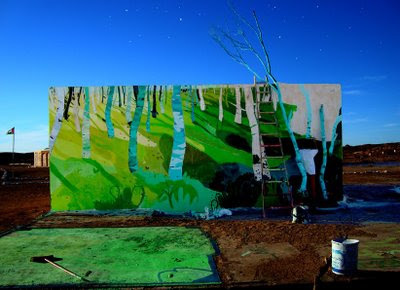 I stop by the beautiful mural that María Ortega Estepa is painting in the wall of an abandoned house. Travelling Paradise is an enchanted forest that grows breathing luminous in the inmensity of the desert. The wind has calmed and there reigns an absolute peace. 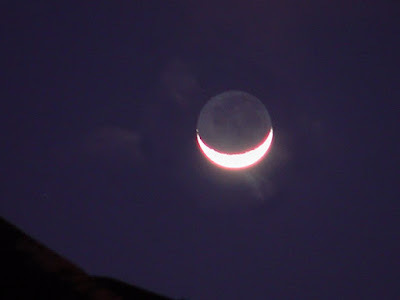 Up there, the Moon placidly smiles at me as she lays near Venus and Jupiter. Crossing the enormous intergalactic distances, I think that actually the stars are here, since their light has reached us. If not, we would not see them. I bring my steps towards the school because tonight’s program announces a talk in the jaima, the presentation of Taína in the museum and Carmen is inviting for a night tour of Tifariti’s monuments. This is getting more and more exciting. The magic conjunction glowing in the sky. 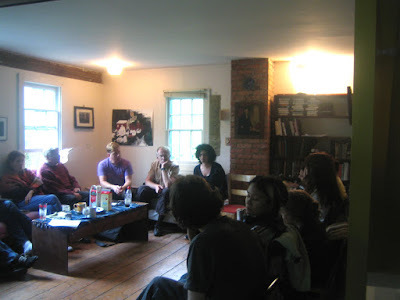 The Naná collective and Taína. Pililli Narbona singing the anthem she's composed for ARTifariti. 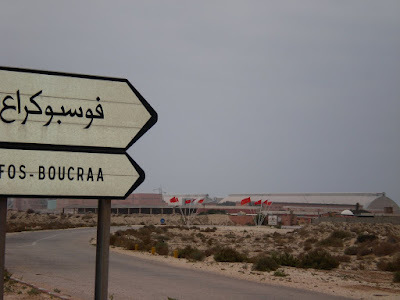 We ask the I Ching: what can we do for Western Sahara's freedom? I interpret the mountain as an image of the Wall of Shame. The sky in the mountain is the liberation movement: a creative force that is building to open up and bring down the wall. There is much energy needed on this effort. 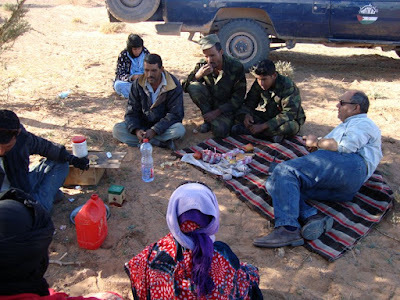 No eating at home means to work in the public, go out and get everybody to know about the Saharawi conflict and respond to this injustice. Having justice on our side we can take any riskful ventures as the crossing of the great waters. 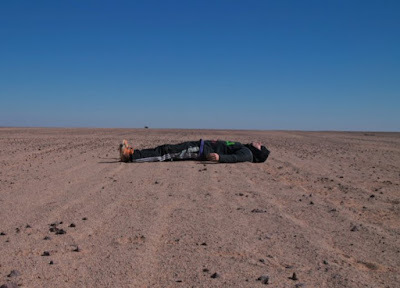 Although I think the I Ching has responded with a bet for peaceful work, a wide sector of the Sahrawi population show some tiredness to pacific ways of resistance. As Valeria explains: “there exists a clear feeling of revenge, more and more strong, specially among the young population, that reclaim to take back the arms after 17 years of the ceasefire. 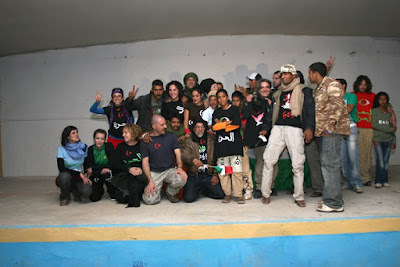 Even president Abdelaziz recently declared in an interview that the card of war is upon the table.” An important solidarity movement of people and NGOs are promoting projects like Peace Holidays –Spanish families adopt Sahrawi children during the summer--, the Peace Caravan –recollection and shipment of food and humanitarian aid--, the cinema festival Fisahara or the arts meetings Artifariti, trying to better the humanitarian situation and fight the forgetfulness of international community. But many here ask “until when they will help us? And what will happen when they get tired of helping us?” We have just learned the regrettable news of two Sahrawi students dead in a protest in Agadir, in the occupied territories, and a bitter feeling takes us. 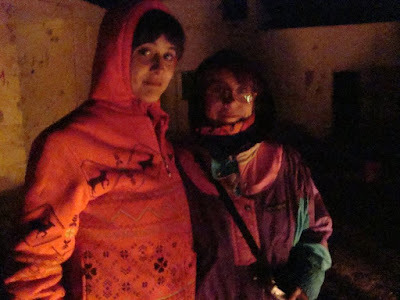 Tonight Carmen is proposing a night tour of Tifariti’s conmemorative monuments. 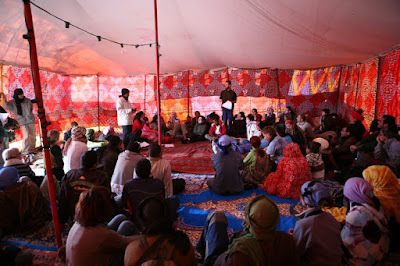 The idea is to walk in solidarity with the Saharawi people, joining them in the night, in the desert and in uncertainty. We meet under the flagpole in front of the school with lanterns and torches. 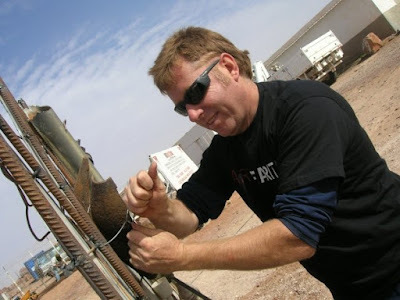 We visit the electric generator, Tifariti’s orchard, the downed Moroccan tank and the river bed where many taljas grow. 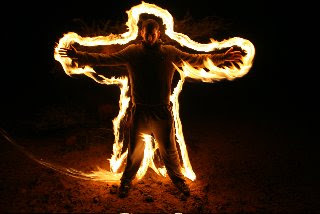 We make fire drawings in the air with the torches and the young polisarios start yelling freedom shouts in hassania. The tour is turning into an spontaneous protest. I’m sure that with all this creative energy we will some day sing the Yahuti Sahara national anthem with our Sahrawi friends in their free land. The chi of the desert. 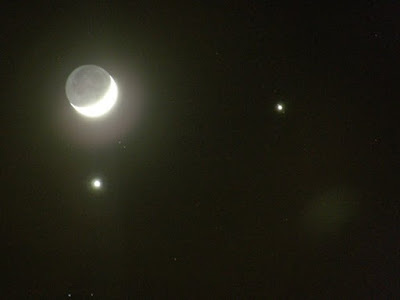 The moon’s conjunction with Venus and Jupiter keeps magically glowing in the sky. Isidro López Aparicio and Pamen Pereira have told me about the night in the desert, when they spent 24 hours in a hole excavated in the ground to come out and expose themselves on top of a platform. The action points both to the isolation of the Sahrawi people from the international community, and also the need of visualization and repolitization of the conflict. 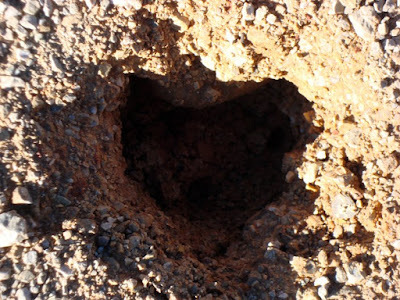 We don´t want to go to sleep yet, so we take out Taina’s telescope and binoculars and walk out in the desert. 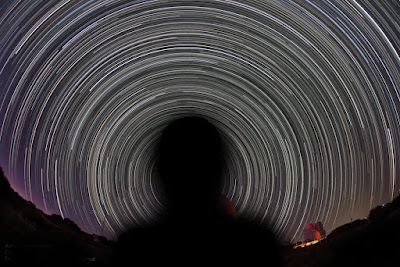 Sahara’s celestial dome is flooded with stars from the zenith to the horizon. They say there are more stars in the sky than grains of sand in Sahara. As Moulud and Baecha explain, Ursa Major here is called Eswabia, and the Pleyades are called Ezraia. 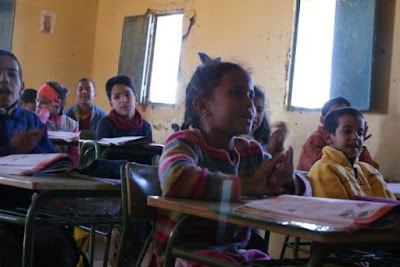 For many of the constellations the Sahrawi have myths and stories so the children start to know them. I have Orion shining just on top of my head. 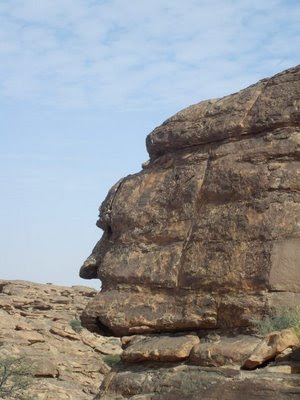 The human figure it draws is “the man” –El Machboh. According to the legend this man killed the prophet’s camel, and as a punishment, Allah placed him eternally in the firmament. 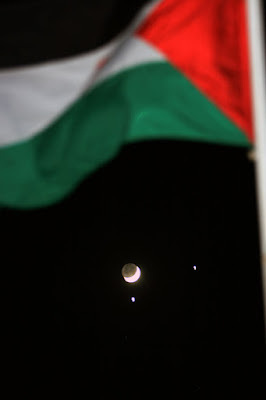 In his hand there shines the red star Betelgeuse (yad al-jawza or “Jauza’s hand”) tainted with the crime’s blood. I stick my hand in the sand and it’s soft and cool. I stick it deeper and it feels cooler. 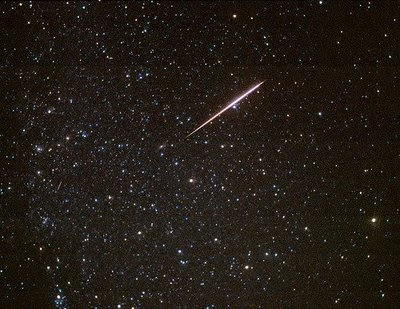 An enormous shooting stars crosses the heavens during some eternal seconds. And another, and another… and so on until I lose track. I have asked the same wish to all: that we wake up from this nightmare and are already in paradise. 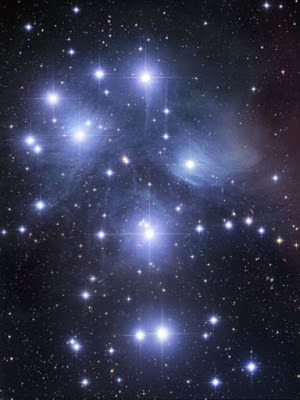 I fall sleep under the Pleyades that draw their inmense question mark on the sheltering sky. The next morning I am working on the sculpture. I think it would be great to make a tree with all the mines, bombs and grenades hanging from it, as if to transform death into life. But I only have three days to make it and I go for a more straight forward solution. 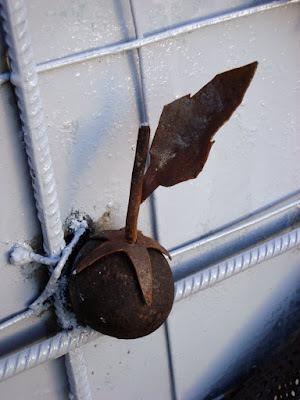 I have cutted out a metal sheet in the form of an explosion and I’m welding all this war junk on it. 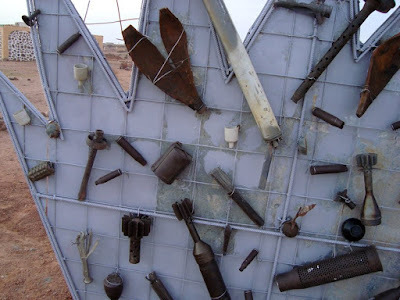 It really looks like a “wall of shame.” In it you can both identify each mine, projectile and cluster bomb that you may see in the country as well as realize the atrocity that the feudal regime of Morocco has inflicted on Western Sahara. 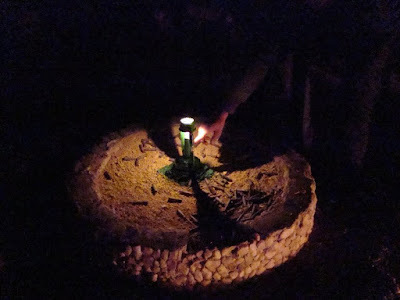 On that evening we inaugurate the work with a simple ceremony. Ahmed concludes pointing at the astonishing sinchronicity we are living: today, December 3rd 2008, ninety-two nations have signed in Oslo a historical treaty at the Convention of Cluster Munitions, that forbids the production, storage, use and exportation of cluster bombs. The only countries that have not signed the treaty are the U.S., Russia, Israel... and Morocco. 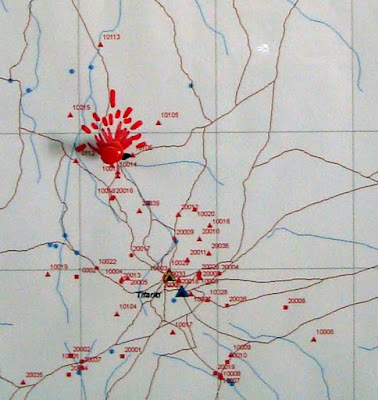 Landmine map of the region of Tifariti showing accidents. 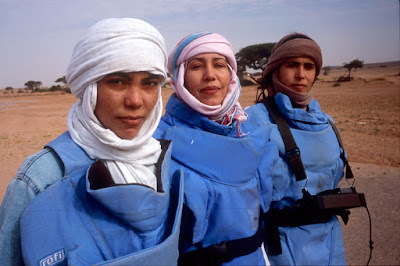 Toufa, Chaiha y Mariam, the first and only women working on Sahara's landmine clearing. Photo: Pablo Balbontín. Great models with a mix of innocence and profesionality. Pililli and her kids. Photo Pepe Caparrós. After the show we have camel paella for dinner. 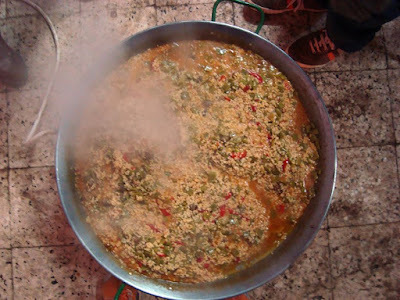 Taína comes with the very special recipe from my friend Miguel and the idea is to create a gastronomical mix adding the local camel meat to our traditional Spanish paella. With the help of Guillermo, Carmen and Cheb the paella comes out delicious. Agripino y Protasia made a special breads cooked in the sand and we all eat with delight. 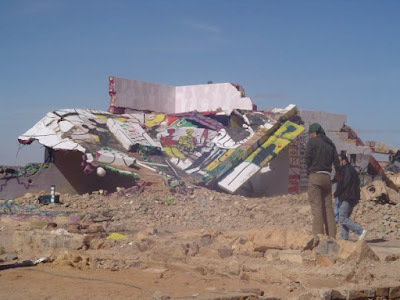 After dinner Chaska announces that the Algerian artists have convoked us in the ruins of the bombarded military barracks for a minute of silence for Jaya Dada and Kteif El Husein, the Sahrawi students dead in Agadir. In the cold of the night we walk to the bombarded houses to the West where the Algerian artists have painted the most impressive murals, turning the ruins of the old Spanish military headquarters into a monument of Morocco’s savagery. Each one of us lights a candle and we go around a bonfire and hold each other’s hand in silence. 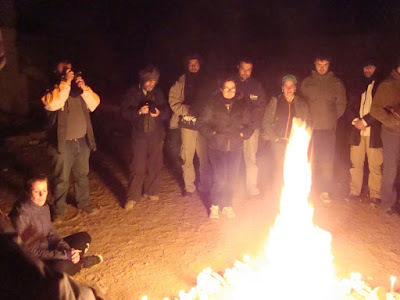 We make an emotive vow of solidarity and seal our oath in the fire to get together again next year in Tifariti. 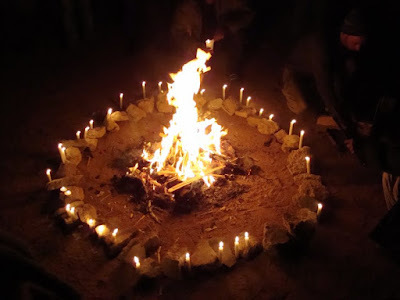 This shamanic circle that is closing seems to announce a new era for all. Aïdoud Walid presents his moving intervention So Much We Need The Light, a tenous candle lit among ammunition remains on the broken pedestal of a flagpole. In the darkness I touch the light… I remember the beautiful landscape that Eva Lootz has created in the assembly hall floor with hundreds of oil lamps reminiscent of the desert caravans. How true… So much we need the light in this dark night. Warming my hands in the bonfire I think how Chinese medicine explains that we ourselves are light from the stars, divine energy that vibrating at a slower rate becomes solid. Also quantum physics has discovered that on top of matter, antimatter, atoms, protons, photons and quarks there is an original energy from which eveything comes. The life force inside each and everyone of us contains all the power of the Universe. The thing is: what are we going to do with it? 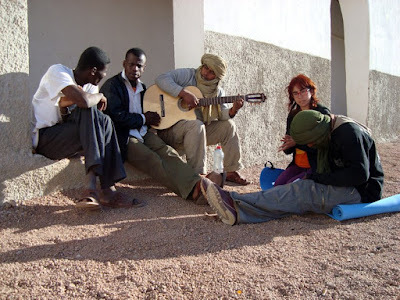 My friends shake me out of my dreaming saying goodbye with emotion: Avec a grand embrace j’esper vous revoir le prochaine aneè a Tifariti ¡¡¡ Vive le Sahara cabrones!!! We embrace each other and start shouting SAHARA FREEDOM! 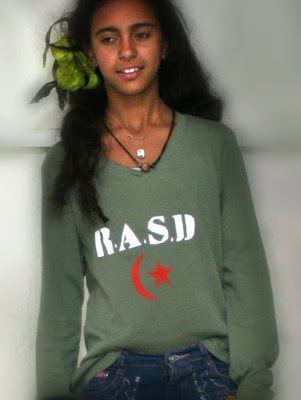 POLISARIO SHALL OVERCOME!!! 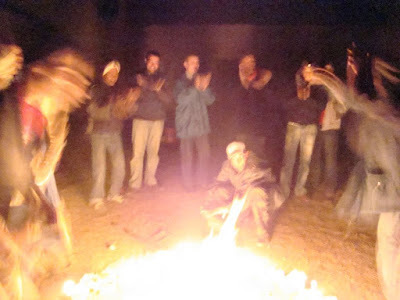 We sing Aicha and dance jumping over the bonfire as if it was the fire of a Saint John’s night. One minute of silence for the martyrs. 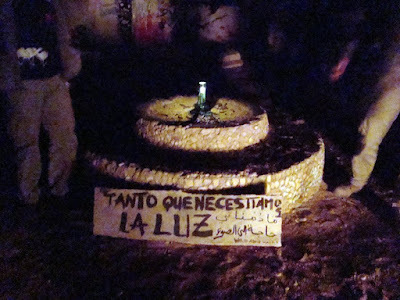 Aïdoud Walid's intervention: So much we need light. 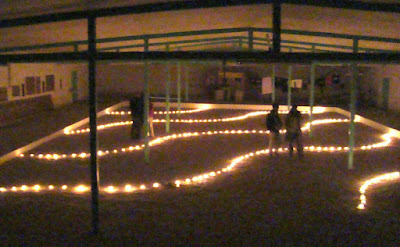 Eva Lootz's Light for All in the assembly hall. We depart at dawn and a long caravan of all terrain vehicles is parked outside of the school waiting for us. The first Sun rays illuminate Maria’s Paradise and its bright yellow, gold and greens explode against the morning blue sky. This enchanted forest concentrates the efforts of nature towards light and remains as a testimony of the ireducibility of life itself. In Islam, green is a heraldic color because “water, greenery and a beautiful face” (as the Prophet said) are in the basis of esoteric rejection of indifference and separation. I am beginning to understand that, even in the desert, paradise is possible as spontaneous organic crystallization of life’s desire for more life. Paradise is all, once we learn to find it inside ourselves. The drivers are calling us honking the horns and the all terrains start to rise dust whirlwinds. Hamdi plays once more the Estrella Polisaria tape. We leave, but we take Sahara in our heart. María Ortega Estepa. Travelling Paradise. I’m back home. Sleepy as I get off the plane in Madrid Terminal 4 the opulent and futuristic architecture reflects the gloss of the winter Sun. Everything looks colored and unreal. 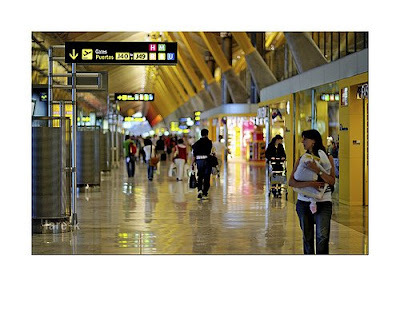 The familiar becomes strange watching people compulsively talking on their mobiles and drifting like ghosts among the glittering airport shops and under the hypnotic PA system messages that tell us “to control our belongings for our own security”. We are already in Europe. Pushing a luggage car full of contradictory emotions I ask myself why the world is so unequal. Our friend Matala’s words resonate in my head: “Now you go to the land where there’s green grass, flowers and good food, and you’ll forget about us…” I’m starting to be afraid that he’s right and all that we have lived and experienced with the Sahrawi people is going to become a passing dream as it has never happened. To weak up in the reality of the monist materialism of State Capital makes me write this notes not to forget the profound experiences I have lived, some as difficult to digest as the desert stones themselves. No, I’m not going to forget. The journey has been to advance towards a mirage that reflects the distorted image of our society of ostentation, waste and ignorance. We have crossed the mirror to find in the Sahrawi people a happiness, generosity and resistance in the face of adversity that we have already forgotten. I start to value the lesson I’ve learnt, and to understand that the road to Sahara’s freedom is the road to our own freedom. 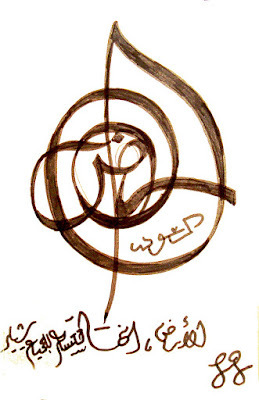 In Arabic it says: "There is room for all in the Earth"
In this travel diary my friends Robin Kahn, Kirby and Zora Gookin helped map the contours of this blog. Sukran! I have used images from my fellow travelers and different sources. 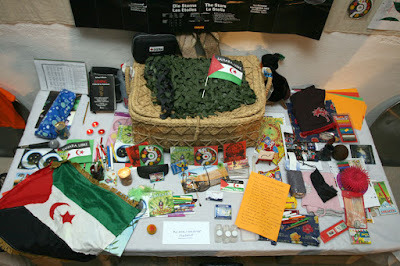 The copyright belongs to the authors: Pablo Balbontín, Abdelkader Belkhorissat, Pepe Caparrós, Carmen Carmona, Alonso Gil, Carlos de Gredos, Isabel Inés Casasnovas, Lefrig Museum of the Sahrawi Resistance, Carmina López Rodríguez, Nuria Meseguer, Teresa Muñiz López, Pililli Narbona, Javier Navarro, María Ortega Estepa, Barris Syphax, Valeria Saccone, Miguel Vila and Western Sahara Resources Watch. Salam Ailekum by Federico Guzmán is licensed under a Creative Commons Attribution 3.0 Unported License.